Kentucky Fried Chicken (KFC) initially specialized on fried chicken. The advocacy of healthy meals and method of preparation forced KFC to seek other healthier food preparation methods like grilling. Currently, KFC has incorporated grilled meals in their menu on top of the traditional fried chicken. The chicken meals at the restaurant are classy with diverse recipes for different chicken menus. The restaurant is expensive compared to similar restaurants of the same caliber. KFC dates back in 1930s, the founder, Harland Sanders, was given a honorary name Colonel Sanders for his persistence and rapid growth of the chain of restaurants which currently stands at 19,000 in different continents globally. Their headquarters is in Kentucky, where the first restaurant was built; after McDonald’s KFC, takes the second position. The restaurant serves 13 meals. 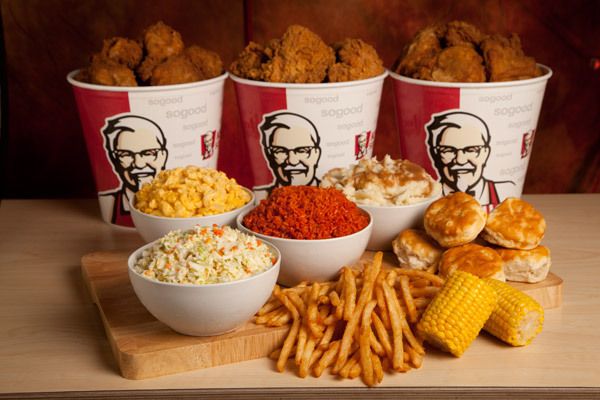 They include combos, hot chicken, hot tenders, popcorn nuggets, kid’s meals, family meals, crafted sides, colonel value, family ups, fillers, drinks, big box meals and desserts. Either a side accompanies KFC’s combos or a medium-size drink in each meal plan, this category costs averagely $5.99. A unique menu in the category is the large combo, which costs $1.50. The meal plans include the large combo, little chicken combo, popcorn nuggets combo, double sandwich combo and 2 pieces chicken combo. There are three meals in this category. They include single basket, double basket and 8 pieces of chicken. The single and double basket consists of the chicken breast, drumsticks, thigh with a biscuit. They cost about$5.49. The other meal is a large meal of 8 pieces of chicken accompanied with biscuits, mashed potatoes, large coleslaw and 4 pieces f biscuits. The entire meal costs about$21.99. They are also three meals in this meal plan. They include the 3 pieces, 12 pieces and 24pieces of tenders accompanied with mashed potatoes, biscuits and large coleslaw. The 24-piece meal is also referred to as a Tailgate meal. They cost $5.49, $21.99 and $29.99 respectively. A medium-size drink and a single side accompany this meal plan. They are chicken tenders of 3 pieces, 6 pieces and 12 pieces, as well as the large popcorn nuggets. The price ranges from $3.99-$12.99. KFC accommodates even the kids as well. The kid’s meal plan consists of the drum stick, a piece of chicken, popcorn nugget or tenders, accompanied by an individual drink or a small drink depending on your desired choice, all these at a cost of $3.99. The entire family can also enjoy the family meal plans at KFC. The meals include 8 pieces, 12 pieces or 16 pieces of chicken. You also have a choice to enjoy 6 pieces r 12 pieces of tenders. Biscuits, large sides and sauces accompany all the family meals. The prices depend on the quantity ordered. You could also enjoy a chicken only meal at $14.99. These are cheapest meals which is just a single meal prepared. They include mashed potatoes, baked beans, cole slaw, green beans, cheese and biscuits. Any of the meals costs less than $2. They are served in either large or individual quantities. This is a special menu named after the founder. It consists of hot wings, little chicken, popcorn nuggets, tenders and wedges. They average costs $2.50. Family fill up is a menu, which costs $20. It is ideal for the entire family. It consists of 8 pieces of chicken, mashed potatoes, biscuits and coleslaw. This is a $5 meal plan which consists of 2 pieces of drum sticks or chicken breast, tenders, or bowls, or pot pie, chicken thigh accompanied by, biscuits, cookies and a medium sized drink. This meal plan is mostly for take always and served in a box. They include 2 pieces of chicken or 3 tenders accompanied by a medium size drink, or a biscuit, mashed potatoes. It is suitable a=for a single person. The meal plan in this category cost averagely $7.99. KFC has proved beyond reasonable doubt that as long as you define your niche you can succeed despite the competition.